Dutch Michelin starred chef Erik van Loo is a street food aficionado. He published a cookbook with his interpretation of the food he eats on the streets of his hometown, Rotterdam. This recipe is a simplified version of the lamb spareribs in his book. 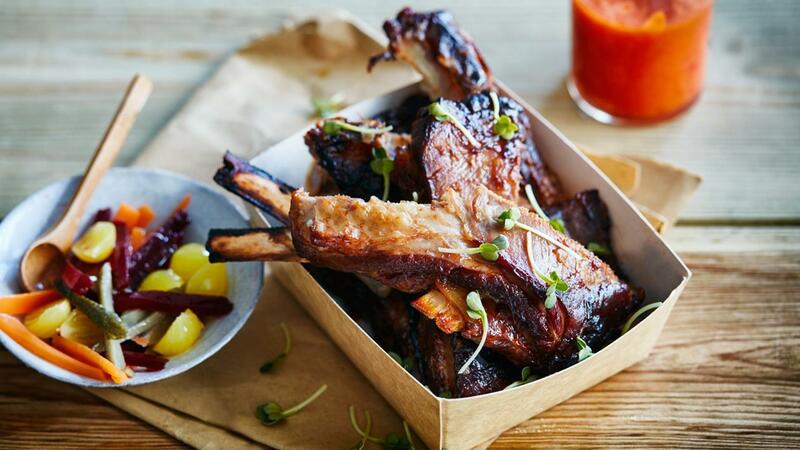 Leave the lamb to marinate overnight and you will end up with tender, intensely flavoured ribs. Mix all the ingredients, except for the spare ribs, in a bowl. Put the ribs in a large pan; pour over the marinade, cover and leave to marinate for 12 hours in the refrigerator. Cook the spareribs on low heat until they are just done. Check regularly: the meat should be tender and soft but it shouldn't fall of the bone. Remove the ribs from the pan and leave to cool. Reduce the marinade until 400 ml of liquid. Put through a sieve and keep aside. Remove the skin of the bell peppers with a vegetable peeler, clean them and chop into pieces. Cook in a little water until tender and blend smooth. Bring the pepper puree to the boil with the marinade, the orange juice and the ketchup. Reduce by half. Leave to cool and whisk in the olive oil. Finely dice or thinly slice the beetroots and the carrots. Bring the vinegar to a boil with the sugar, the shallots, the thyme and 150 ml of water and stir until the sugar is dissolved. Pour the hot mixture through a sieve over the vegetables and leave to cool. Mix the pickled beetroot and carrots with the gherkins and silver onions. Cut the ribs into serving portions and serve with the dressing and the sweet and sour vegetables. Garnish with rocket cress.